Mount Abu, sprawling along a 1200 m high plateau in the south of the state, close to the Gujarat border. Rajasthan's only hill station and a major pilgrim centre, Mount Abu is located in the south-western corner of Rajasthan. Although a part of the Aravalli range, it is detached completely from it by a narrow valley and the highest point, Guru Shikhar, is situated at its northern end. Interestingly, this is the highest point between the Nilgiris in the south and the Himalayan range up north. Mount Abu, owing to its good rainfall, has the richest vegetation in Rajasthan - a wide variety of trees and shrubs can be viewed as one drives upto Mount Abu. More than the weather, vegetation and mythological importance, it is the Jain temples that draw lakhs of visitors to Mount Abu. The Dilwara temples are the best Jain temples in the country. No description can do justice to their beauty. They are to be seen to be believed. Gaumukh Temple, Achalgarh Fort, Toad's Rock, Sunset Point, Trevor's Tank are some of the interesting areas to be visited. For those who like Walking, Mount Abu has many delightful walks. Nakki Lake, said to have been carved out by the gods with their nails, is a favourite spot for boating. 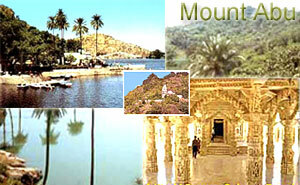 Mount Abu is best visited during March-June and September-November. These remarkable Jain temples are Mount Abu's main attraction and among the finestDilwara Temple, Mount Abu examples includes two temples in which the art of carving marble reached unsurpassed heights. The older of the temples is the ' Vimal Vasahi ', built in 1031 and dedicated to the first tirthankar, Adinath. In the front of the temple stands the ' House of Elephants ', with figures of elephants marching in procession to the temple entrance. The later ' Tejpal temple ' is dedicated to Neminath, the 22nd tirthankar, and was built in 1230 by the brothers Tejpal and Vastupal. The carving is so fine that, in places, the marble becomes almost transparent. Kesar Bhawan Palace is one of the oldest places in Mount Abu, built in 1868. The Kesar Bhawan was used as a guest house for visiting dignitories. For 100 years now several Maharajas and royal guests from the west have been entertained in Kesar Bhawan. Built to suit the climatic conditions of Mount Abu which has an average rainfall of 150 inches annually, the palace has closed corridor running around the building providing it protection from rain. Each bedroom has its own private balcony which provide a panoramic view of the surrrounding hills and valleys. Situated on one of the highest points in Mount Abu is the summer palace of the Maharaja of Bharatpur. Now it is called the Sunrise Palace, provides a breathtaking panoramic view of lush green Aravallis surrounding it. The 80 years old palace has a fairy tale charm to it and is build like a typical british-style mansion. It has large spacious rooms, which have been done tastefully and provides all possible comforts to the guests. It is popular with honeymooners as well as those looking for a peaceful holiday. It is the oldest temple, built in 1030 by Vimala Shah, a minister of Solanki ruler of Gujarat. The temple is said to have involved a work force of 2700 men, and taken total fourteen years to complete. Made of white marble, it is an outstanding example of Jain temple architecture. The fine specimen of workmanship , as seen in its carvings and pillars, this temple is dedicated to Neminath - the twenty second Jain thirthankara. A lot of inspiration and encouragement went into the construction of this temple. Built in the ' Solanki ' style of architecture, this temple has a breaktaking marble pendant hanging like a shandelier from the central dome of the porch. Built in 1232 by two wealthy brothers. Its carved ornamentation is even richer, denser and more delicate. In some places, the marble carving is so fine. The doorways of the temples are framed by ornate pediments and plasters; the columns are magnificiently carved. Nakki LakeNakki Lake is virtually in the heart of Mount Abu and is a big attraction with tourists. The lake takes its name from the legend that it was scooped out by a god, using only his nails, or nakh. It's a pleasant stroll around the lake - look for the strange rock formations. On the lake there is a dilapidated concrete boat-shaped snack bar. Down on the Abu road side of Mount Abu, a small stream flows from the mouth of a marble cow, giving the shrine its name. There is also a marble figure of Nandi, Shiva's vehicle. The tank here, ' Agni Kund ', is said to be the site of the sacrificial fire made by the sage Vasishta, from which four of the great Rajput clans were born, An image of Vasishta is flanked by figures of Rama and Krishna.Gomukh Temple contains images of Lord Rama and Lord Krishna. Connaught House in Mount Abu was the official summer residence of Sir Donald Field, Chief Minister of the Jodhpur and now it is available to tourists and holiday makers. Connaught House is in a very good condition. New rooms have been added to the old cottages. The location of the cottage gives it a complete privacy and allow the tourist to enjoy a quiet and peaceful holiday. The main market place and the famous Nakki Lake are with walking distance. This fort was built by the warrior King Rana Kumbha, who conquered Mount Abu from its Chauhan rulers. It lies 5 miles from Mount Abu. Nearby there are several ancient temples. Of these, the most interesting is the 15th century temple of Lord Shiva. The peak of Guru Shikhar, the highest point in Rajasthan, lies about 2 miles beyond Achalgarh. It commands a bird eye view of Abu and the surrounding areas. Temples located in this area are the ' Mira temple ' and ' Chaumundi temple '. Adhar Devi TempleThree kilometres north of town, some 365 steps lead to this ' Durga temple ' built in a natural cleft in the rock. You have to stoop to get through the low entrance to the temple. There are fine views over Mount Abu from up here. This temple is one of the favourite tourist spots of Mount Abu. It is believed that the image of the goddess was originally hanging in mid-air, hence the name is ' Adhar Devi '. Famous restaurant names and their addresses. By Bus : There are many deluxe buses operating from Mount Abu to Jaipur, Ajmer, Udaipur, Jodhpur, Ahmedabad and Surat. By Train : There are direct trains run from Mount Abu to Ajmer, Jodhpur, Jaipur, Ahmedabad and Agra.